In 1898, the city of Baltimore subsidized the creation of the Western Maryland Railroad, intended as an alternative that would compete with the high prices of the Baltimore and Ohio line, which had also been co-founded by the city over 70 years earlier. 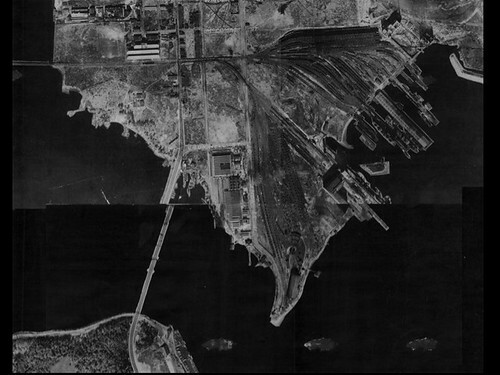 The two networks ran side by side without overlapping to terminals on the South Baltimore peninsula, where they both unloaded coal from Appalachia to ships that would take it up down the East Coast. 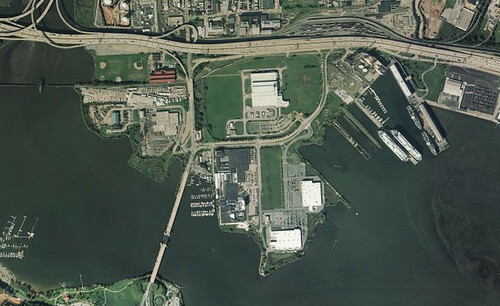 Port Covington, the lower half of the South Baltimore peninsula, is today cut off from the rest of the city by Interstate 95. Historically, this site has always been a place with goods, people, and raw materials moving through it. Before an expansion of the city's boundaries in 1918, this was its southern limit. Light Street continued south to Brooklyn and Curtis Bay via a bridge that took off here. Then, as now, the spaces on the ground between these lines of connection and transfer were largely forgotten and undeveloped. In the 19th century, this area was the backyard and back door to the city of Baltimore, and like any backyard, this was a place for recreation and storage, comingled with trash and half-completed projects. 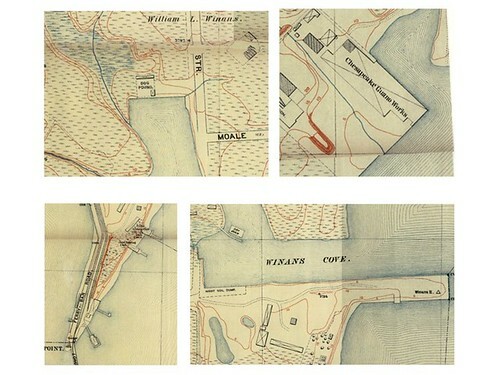 The map above, part of a citywide topographic survey from 1895, shows rowing piers and resorts among the marshes, along with a dog pound, a guano pier, and a "night soil dump". The major landowner was the Winans family, who held a large estate situated up the Gwynns Falls from the port. This stream valley connection between these two pieces of property later became the right of way for the Western Maryland Railroad in the 1890s. And, after it narrowly missed becoming an expressway in the 1980s, it was turned into the Gwynns Falls recreational trail during the late 1990s, connecting the waterfront to the Winans Estate, now Leakin Park. The Winans were a family of engineers and entrepeneurs. Ross Winans had been sent to England by the B&O to study the state of the art in European rail technology. When he returned, it was as the lead designer for the new American railroad's rolling stock. Ross's other projects included a water wheel that powered the plumbing for the estate, and, during the Civil War, a steam powered machine gun. This aerial view from 1869 shows Port Convington as a kind of tinkerer's paradise, with swamps, stockyards, chemical factories, and gas tanks. On the pier at Winans Cove, another of Ross Winan's projects is visible, a prototype Cigar Ship, the first all iron (not iron-clad) steamship in the country. Having solved the problem of efficient cross-country travel, the engineer had then tried to work out better ways to get people across the Atlantic. "Here, M. Aronnax, are the several dimensions of the boat you are in. It is an elongated cylinder with conical ends. It is very like a cigar in shape, a shape already adopted in London in several constructions of the same sort." The aesthetics of Baltimore's working harbor have evolved from this kind of 19th Century Steampunk Imaginary to the Romantic Decay of the present, but they've come here by way of the 1950s, the high water mark of the Industrial Sublime. 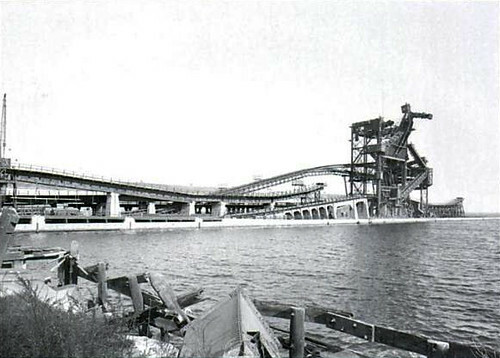 Pictorial photographers, especially Aubrey Bodine, came to Port Covington to shoot artifacts like this roller coaster coal loader at the Western Maryland Railroad terminal, yards away from the last fragments of Ross Winan's pier. This was the endpoint of a rail network that extended deep into coal country. 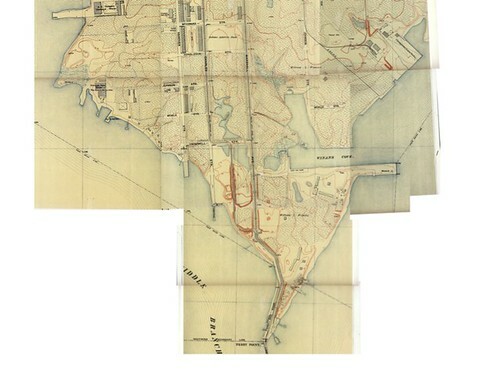 The importance of that connection is underscored in this map: the name of the port, a neighborhood within the city of Baltimore, is printed larger than the name of Annapolis, the state capitol. The Western Maryland Railroad was bought out by its old competitor, the B&O, in 1983, and shut down soon after. 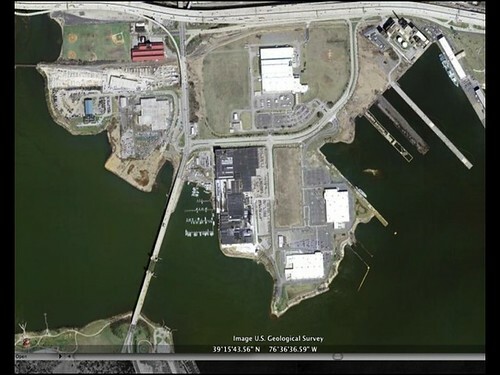 Almost every trace of it at Port Covington has been erased in a cleanup of the site by the Maryland Department of the Environment. The major pieces that remain include a large trestle bridge over the outflow of the Gwynns Falls, and several derelict piers. One of these is now used as a berth for two MARAD ships, the military's ready reserve, part of a large network of ships waiting to deploy personnel, vehicles, and supplies anywhere in the world. 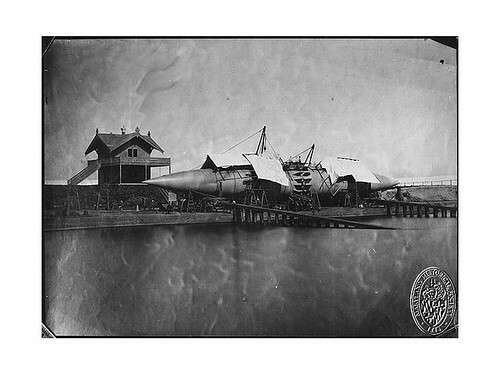 The site is littered with big pieces: the piers, these ships, a factory that makes ceramic insulators, a power station. But the largest things here are the ghosts of failed masterplans. 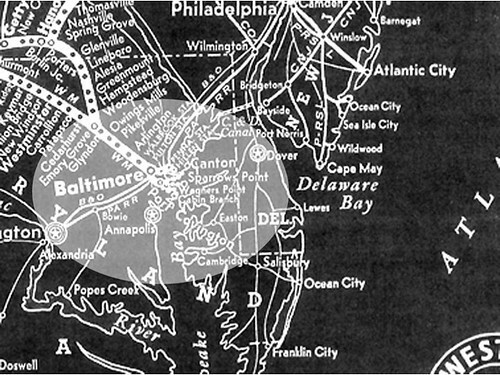 In the 1980s, the Baltimore Sun wanted to move their entire operation out of downtown. With the city's help, the Sun acquired an enormous piece of land in Port Covington, on the south side of 95. They moved the printing presses into a new building here, with Automated Guided Vehicles to transport the stacks of newsprint around the building, and then changed their minds. Now it sits surrounded by empty, well mown, grass fields. As of this writing, the Sun's paper circulation continues to fall, over 9% in the past six months, with a near 6% drop in the six months previous to that. The slow motion collapse of the Port Covington Shopping Center has left behind the most recent ghosts. 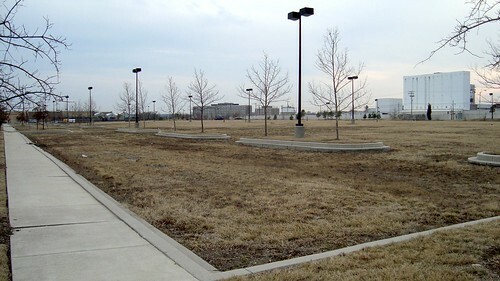 In 2000, the Baltimore Development Corporation accepted a proposal from Connecticut retail development conglomerate Starwood Ceruzzi for the site. 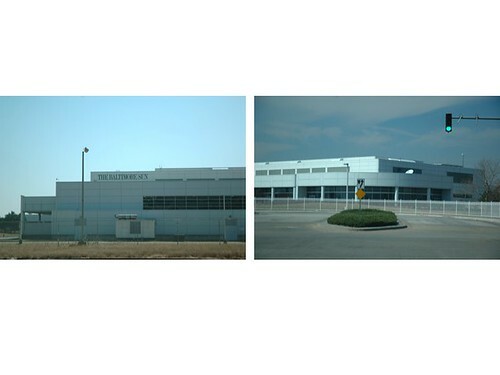 The city enabled the deal with tax incentives, rezoning, and an agreement giving the developer inculpablility from health hazards related to contamination. Starwood promised to bring a mix of retailers, and agreed to consider community recommendations to orient the buildings toward the water, and to "substantially enlarge the park area, incorporate walking paths, add sports fields, create picnic areas and include fishing and crabbing piers,". The city laid out roads, curbs, stop signs, streetlights, even fire hydrants, but Starwood Ceruzzi built only the Walmart and the Sam's Club, both with their backs to the water. 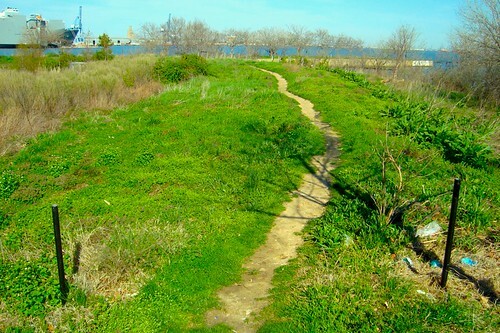 Ferry Bar Park, at the very southern tip of Port Covington is the remnant of a railroad right-of-way, it was given to the city in 1979. 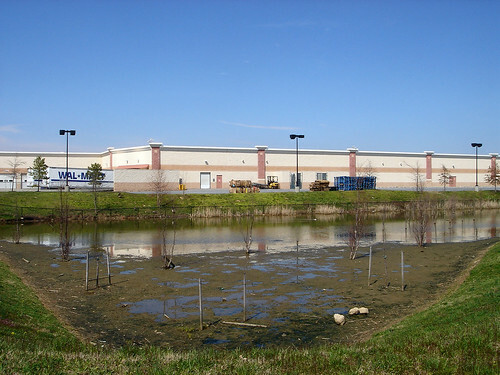 Some documents suggest that the park may have been encroached on by the shopping center's stormwater retention pond, a pond that, given the large amount of planned but unpaved area, my be unnecessary. 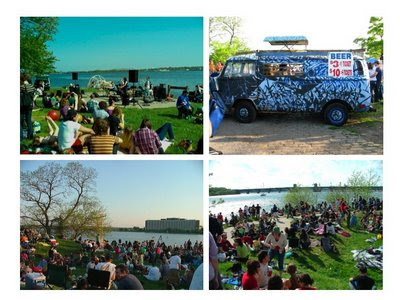 The park is the site of the Baltimore Powwow, a largely undocumented yearly art and music festival, held to benefit the Arabber Preservation Society. 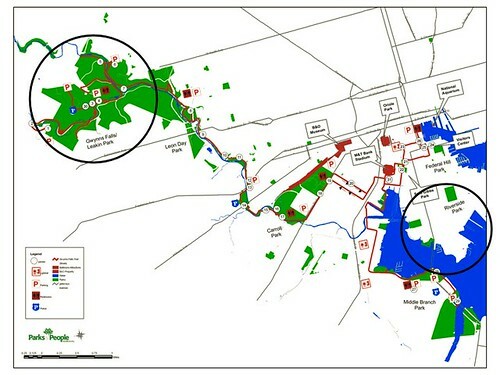 The continued existence of the Powwow, along with the presence of homeless camps (oriented toward the water) and ongoing illegal dumping at the site, suggest that if shopping center developers aren't in a position to deal with the local, then the local will, however imperfectly, deal with itself. Like the factories in the 19th century marshes, the adhoc uses are filling in the gaps between the bigger, broken pieces; with small scale occupancy, habitation, and transportation, leaving desire lines (and litter) threaded across the fenced lots. 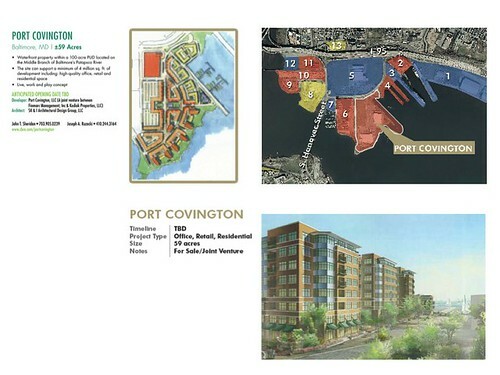 The failure of the last laid plans is little deterrent to future projects, including at least one proposal that shows the existing Walmart gone, replaced by waterfront housing, and a new big box store relocated further inland. This is a site that is suspended somewhere between development and use, between stated intention, and actual condition. The gaps between overreach and underinvestment are filled in by the people on the ground. The empty parking lots are left to drifting plastic shopping bags and idling interstate buses. On sunny weekends, the derelict piers are covered with people, multiethnic families having picnics, playing the radio, and catching the fish that swim in the 150 year old piles of the Winan's Wharf. This is not to suggest some kind of schadenfreude at the failure of Grand Plans, or a naive love of Romantic Decay. This is to suggest that there are alternatives between the top-down of strategies masterplanning and the bottom-up tactics of the everyday. This is not a balance, more a productive, intermingling, dis-integration whose synthesis and realization can, like the Cigar Ship, occur more in the realm of cultural imagination than hard engineering. Great stuff, Fred. Love (a) the Cigar Ship as a symbol of the value of cultural imagination and (b) that you're trying to pry open a bit of space between balance and synthesis, aiming for something other than a dialectical response to the order of planning and the chaos of decay. I'm not sure that synthesis is quite the right word either, but even if its not, I think I at least get the direction you're moving in with synthesis. Er, "informality" probably would have been a better word to use than "decay".